A noncompete agreement is a restrictive covenant that bars an employee from working for an employer’s competitors for a specific time period after employment is terminated, within a specific geographic area. This time period can range from months to years, depending on the circumstances and the nature of the industry. The geographic area can vary as well: from blocks to cities, to even greater geographic areas. Noncompete agreements usually include non-disclosure and non-solicitation agreements. A non-compete agreement is a restrictive covenant that bars an employee from working for an employer’s competitors for a specific time period after employment is terminated, within a specific geographic area. Illinois courts have held that legitimate business interests exist when trade secrets and special customer relationships exist. On the other hand, if an employee can show that there is little or no repetitive business with the same clients, Illinois courts will find there is no protectable interest involved. Courts have also differentiated between trade secrets and other confidential information that fails to rise to the level of protection of a noncompete agreement. 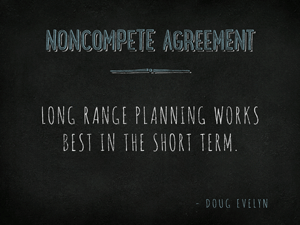 Noncompete agreements, like all contracts, require consideration. Illinois courts have held that since Illinois is an at-will employment state, continued employment constitutes sufficient consideration. Moreover, if hiring is conditioned on signing the noncompete agreement, there is sufficient consideration.